Was thinking about the video I had seen of the woman with the dancing horse. Bev & I had just prayed, as she's been battling severe attacks of witchcraft all week,. 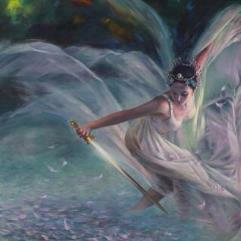 "Arise and Thresh daughter of Zion, for I am putting a bigger sword in your hands. I will strengthen your hands & arms to be able to wield it gracefully for you will dance with me a mighty sword dance in the spirit! Those spirits which have come against you & tormented you and pressed you down will be annhilated & crushed to pieces. Was watching Daniel movie and it was at the point of Mene, Mene Tekel Upharsin written on the wall. “Just as with Nebuchadnezzar’s son, will I remove the rulership of every kingdom under heaven that doesn’t acknowledge me! I will humble all who lift their hearts against Me and My own. The Spirit of the fear of the Lord WILL FALL in My church once again, and all who hear of My power will bow or be humbled! The towers that men have built for themselves will fall. There will be great blood spilling in days ahead, of My children, by the wicked ones, but I will glean a great harvest of souls. The bribes, the murders and deception will be uncovered and undone in this nation. Their arrogance reaches to the heavens. I will humble the arrogant in heart. I am also making new hearts for My people who are called by My name, that they may be known for the love they have for one another. I WILL HAVE MY WAY with My own beloveds. Do not doubt for one second My love for you, and all you have endured, has come up before me as a sweet aroma. 6 And those who have drawn back from following the Lord and those who have not sought the Lord nor inquired for, inquired of, and required the Lord [as their first necessity]. 7 [Hush!] Be silent before the Lord God, for the day [of the vengeance] of the Lord is near; for the Lord has prepared a sacrifice, and He has set apart [for His use] those who have accepted His invitation. Zeph 2:10-11 amp 10 This shall they have for their pride, because they have taunted and boasted against the people of the Lord of hosts. 11 The Lord will be terrible to them, for He will make lean and famish all the gods of the earth; and men shall worship Him, every one from his place, even all the isles and coastlands of the nations.